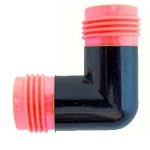 700-710 Drip Irrigation Compression Coupling fits both 700 and 710 drip irrigation tubing and 1/2" soaker hose. Use a 700-710 coupling (fits both 700 and 710) for drip irrigation tubing or 1/2" soaker hose, to connect the two together. Also good for repairs that goof plugs can't handle. Cut out the damaged section of drip tubing or soaker hose, and couple it back together. This fitting has red ends to match our red stripe to match the 1/2" soaker hose. Besides being compression, it also has male garden hose threads.